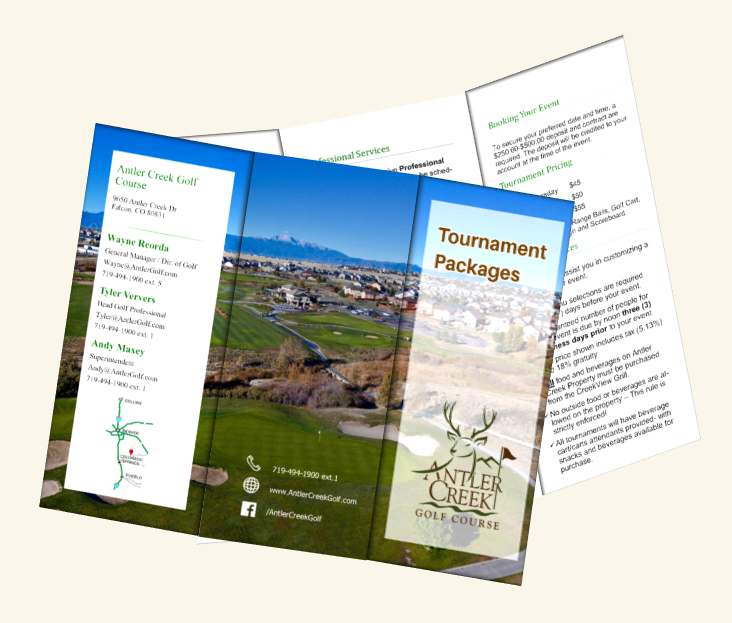 At Antler Creek, we strive to customize each tournament according to your group's specific needs and desires. The staff at Antler Creek is ready to meet your needs and provide you the best golfing and overall experience for your tournament. Whether it be group size, a customized tournament menu, on-course prizes including Hole-In-One awards, or any number of specific details which will make your tournament unique, we are here to help. We have also compiled Tips On Conducting A More Successful Golf Event and Golf Event Policies. Please contact our tournament coordinator for your free copies. 18-hole golf events receive Professional Services from our staff and may be scheduled more than seven days in advance. CreekView Grill offers excellent food and beverage service in a wide range of meal options and pricing, including a beverage cart on the golf course for your convenience. A catering menu can be requested for your review. Arrangements for these services must be made in advance with the course. To secure your desired date and time, a $250.00 deposit and a request form are required. The deposit will be credited to your account at the time of the event. Leave your guests with a lasting impression of the day at Antler Creek Golf Course. We offer a custom logo program that includes several appealing items such a shirts, caps, golf balls, towels and bag tags. Each item can be printed with your corporate or organizational logo. This gives everyone involved in your event a personalized gift of the day, which is always appreciated. Adds an exciting element to your golf event, Antler Creek Golf Course, offers you our Hole-In-One program. We can provide your participants with four hole-in-one prizes on four par 3 holes. Prizes could include trips for two, golf clubs, his and her watches and much more. Please feel free to fill out our tournament information form so that we may better assist you with your tournament planning.